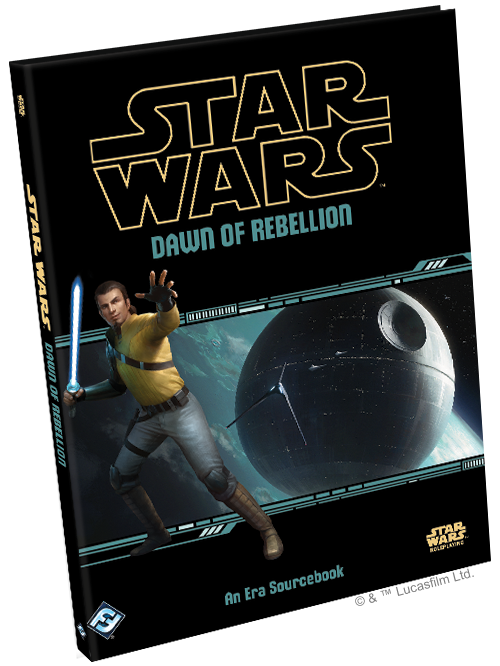 The latest sourcebook for Fantasy Flight Games Star Wars Age of Rebellion is Fully Operational. 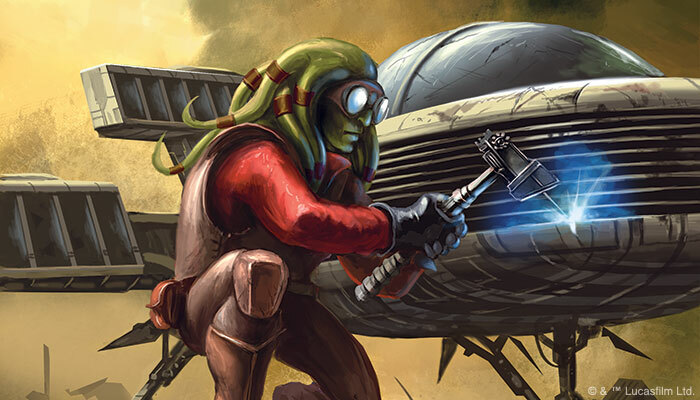 This sourcebook expands the options available for the Engineer career, and adds three new species, three new specialization options, as well as some interesting crafting options to the FFG Star Wars system. 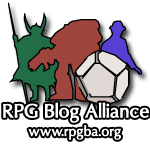 As always, the career sourcebooks follow the familiar format of three sections: player options, gear/vehicles, and finally additional mechanics and systems for GM and PC use. Both Edge and Age have some overlap when it comes to careers and specializations that make sense for PCs in both lines. 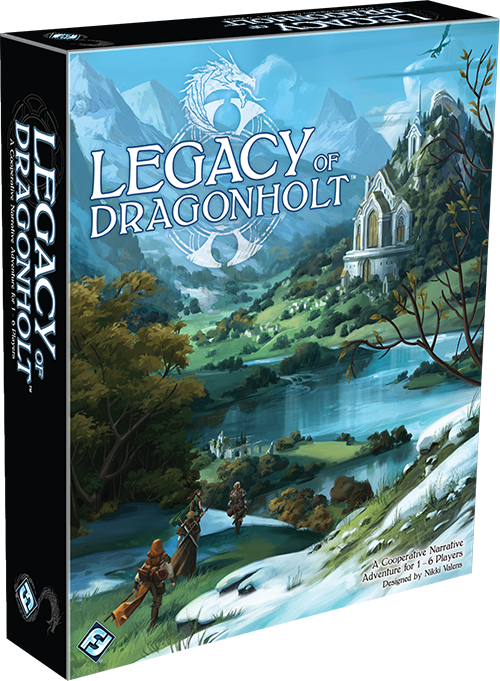 We’ve seen this show up in the past with FFG repeating certain species and specializations that could apply to careers in either line. One could almost understand if FFG wanted to copy and paste from the excellent Edge sourcebook for technicians Special Modifications. In this case, they resisted that temptation, and this book is a better value for it. When reviewing this book, I immediately grabbed my copy of Special Modifications to see if there was any overlap, and I had to do a bit of a double-take: in the new Age book one of the new specializations is Droid Specialist, but in the Edge book it is Droid Tech. The trees have some similar skills, but some unique ones as well. This was a refreshing change from seeing careers like Heavy being copied whole-cloth between lines. It could also allow for some interesting multi-classing giving a PC an opportunity to stack lots of ranks of talents like Machine Mender and Hidden Storage, while also providing new talents in this book like Design Flaw (add 1 advantage per rank when attacking droids at personal scale) and Repair Patch Specialization (heal an additional wound per rank when using an emergency repair patch). Similarly, the crafting section focuses on facility and ship/vehicle crafting and doesn’t go over the gear/droid/cybernetics of the other book. What surprised me the most was how much of this book did not retread what had been established by Special Modifications. Three new species are detailed in this book. The Bith on the cover (made famous as the band members in Mos Eisley cantina), Kaminoans (genetic engineers of the clones from the Clone Wars), and Skakoans, often synonymous with the Techno Union. The Bith, while cool and recognizable from the original trilogy, don’t seem to make the best choice for an engineer. The have a one in brawn and a three in presence, and a two for everything else including Intellect. They start with a rank in perception and have sensitive hearing, but none of that predisposes them to make great engineers. They seem like a better fit for the Colonist-Performer specialization. 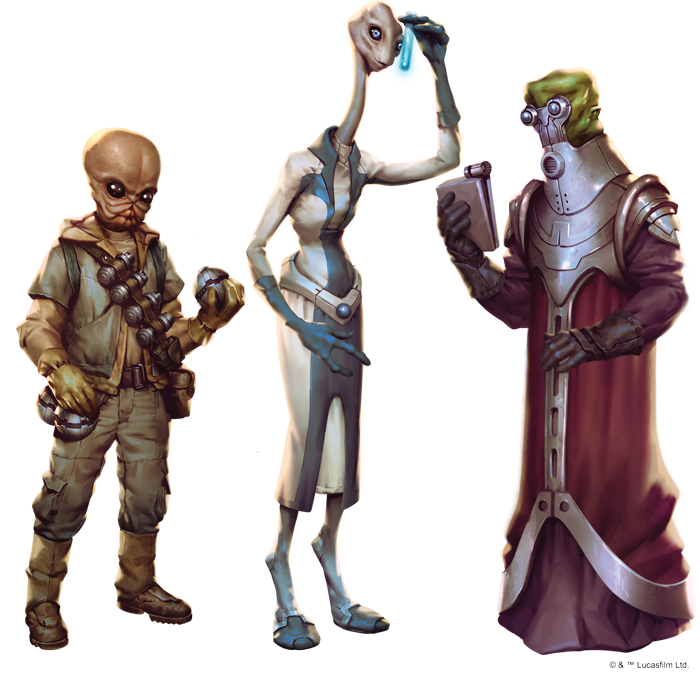 Kaminoans are a natural fit for this book, starting with a three in Intellect, a rank in Medicine, a rank of the Researcher talent, and most humorously trait called Expressionless. This results in a setback die for Charm checks and provides a setback die for others making social skill checks targeting Kaminoans. This really evokes Obi Wan’s experience when meeting them in the prequels, and would be fun to role-play. Skakoans may be the least recognizable of the three, and as methane-breathers like the Gand, can pose environmental challenges other PCs may not face. Interestingly, this is the first species that start the game with a type of armor. They require a specialized pressure suit that provides +2 soak and 3 hard points. They start with a three in Intellect and a rank in Knowledge (Education) and Mechanics, but with only 80 XP. As an Engineer you were going to train those up anyway, so not a bad trade really. 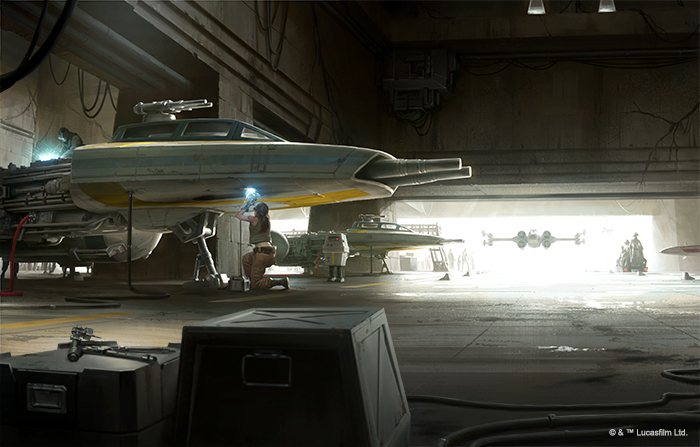 The three new specializations include Droid Specialist, Sapper, and Shipwright. 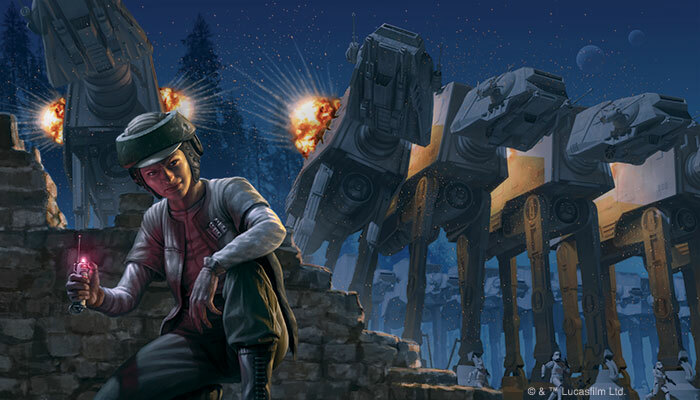 While the Droid Tech in Special Modifications focuses on building and commanding a droid army, the Droid Specialist can build them up, or break them down. In addition to the core Engineer skills of Athletics, Computers, Knowledge (Education), Mechanics, Perception, Piloting (Space), Ranged (Light) and Vigilance, this spec adds another Computers, Cool, another Mechanics, and Melee. These skills paired with the talents in the tree make this PC brainy, but pretty good in a fight at range or up close and personal. The Sapper seems like it would be quite close to the saboteur, and much like the droid specs above they have some similarities, but are not identical at all. The Sapper focuses on construction as well as destruction, specifically of facilities and emplacements. In addition to the core skills, Sapper adds another Athletics, Knowledge (Warfare), another Mechanics, and Survival. One interesting new talent on the tree is Improvised Defenses. This allows the PC to make an average Survival check to create cover for up to four characters for the rest of the encounter. Shipwright is quite the unique specialization. At first blush you would think it would be similar to Rigger in the Ace book or Modder in the Technician book, but it shares very few talents with either. Shipwright adds Gunnery, another Knowledge (Education), another Mechanics and another Piloting (Space) to the Engineer core skills making it the most laser-focused engineer specialization. Some talents you would expect are here like Solid Repairs, but also Dockyard Expertise which reduces time and cost of repairs by 25% per rank. Also Push the Specs which increases the top speed of the ship with an average Knowledge (Education) check. 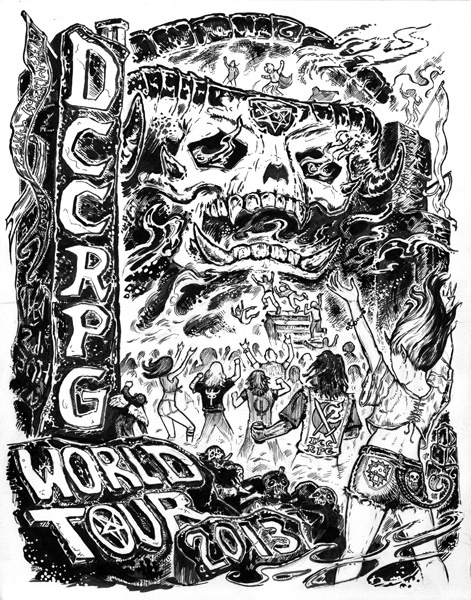 Creative Design allows a PC to apply a number of advantage equal to ranks in the talent to a crafting check, while allowing the GM to apply an equal number of threat. The signature abilities include The Harder They Fall and Unmatched Ingenuity. The Harder They Fall allows once per session, a PC to spend two destiny points and make a hard mechanics check that if successful, automatically critically hit vehicles, droids or structures whenever they suffer wounds or hull trauma. This seems quite overpowered, but most of the signature abilities are. 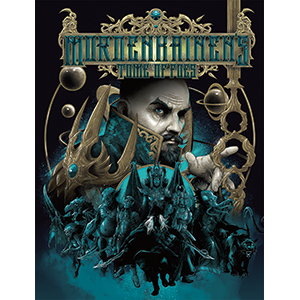 Unmatched Ingenuity allows once per session a PC to spend two destiny points and make a hard mechanics check to add one item quality to a weapon or item they are holding or operating. They can spend a triumph to add an additional quality, and advantage to increase the value of the quality if applicable. The weapons section is pretty excellent for what is one of the more brainy and less combat-focused careers, but as one might expect from a career that includes both saboteur and sapper, the explosives are the highlight. Grenade additions include both Incendiary and Cryoban, as well as explosive compounds and devices for taking out structures and emplacements. My favorite is Flex-5 Detonite Tape that consists of a bulky roll of tape for breaching doors or lightly armored objects. This section also includes stats for Bardium charges, Detonite (think c-4), Fuel-Air Bombs, and Shaped charges. Not only are there stats for one charge, but how they stack when using multiple charges. Gear section highlights include the Model 40 Repulsor Hoist and modular base structures. For a mere 3 encumbrance and 550 credits you can get a set of 6 repulsors to help hoist a disabled vehicle for field repairs or towing up to a silhouette 4 up to two meters high. Modular base structures allow you to build a quick and inexpensive command center, barracks, and hangar/motor pool. 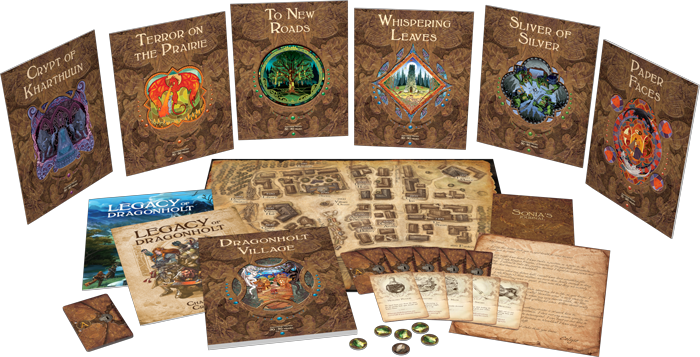 This could be a fun adventure session in itself! The vehicle section has some cool engineer-focused transports and construction vehicles. Among these are stats for a silhouette 7 mobile space dock that would serve as an interesting adventure locale to get ship repairs, or defend from imperial attack. New vehicle weapons include stats for a tow cable launcher, ion torpedoes, and a termite torpedo which would likely be quite the headache for a PC ship targeted by such a weapon. The last section includes some interesting ideas for using the Mechanics skill, as well as spending advantage, threat, triumph and despairs on engineering-focused checks. There is a fairly substantial section on making repair and construction efforts in different settings and environments like an active battlefield, desert/tundra, high-atmosphere, a firefight, forest/jungle, underwater, etc. Next is a section dedicated to converting civilian vehicles and facilities to military applications. This would certainly inspire at least a session or two of game materials. Finally, the most substantial section is dedicated to crafting ships and vehicles. This follows the same format as droids, weapons, and cybernetics from Special Modifications and goes into quite a bit of detail about different aspects such as frames, engines, and hulls. Each of these have their own template tables and advantage/threat, triumph/despair result suggestions. 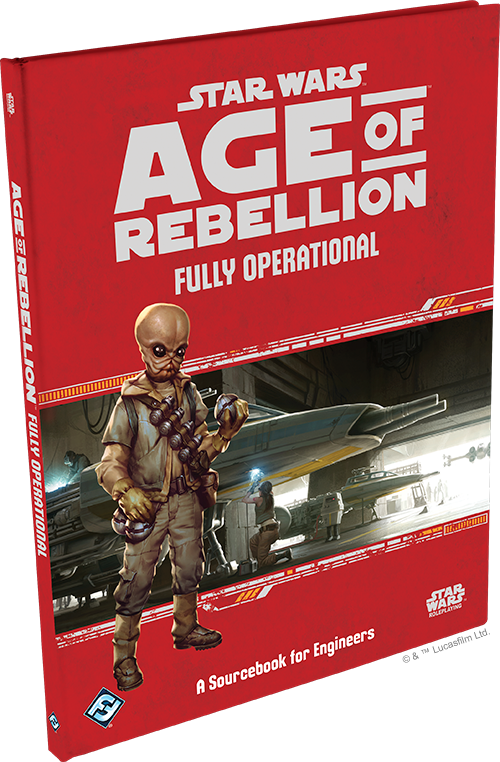 This may prove challenging to get an entire table of PCs to get excited about during a session unless the adventure or campaign is focused on building out new ships and bases for the rebels. 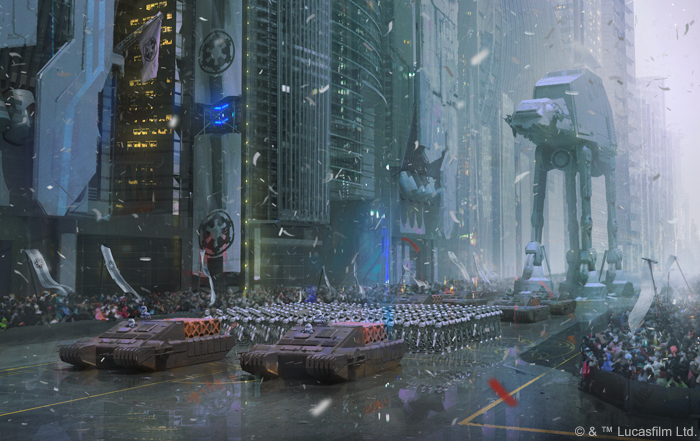 To wrap up the last section there are a few campaign ideas focused on a shipyard, a battle station, and combat engineering. Yet again FFG Star Wars is proving to be consistently high quality and worth purchasing. 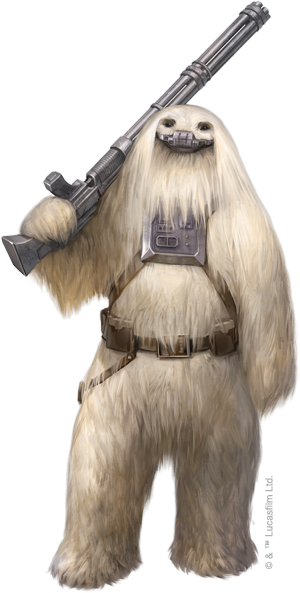 Unlike other RPGs that run out of quality material before they run out of supplements, FFG Star Wars seems to be getting even better and more refined the more books they produce. This is one of the better sourcebooks in the Age line, and I imagine using several ideas from it in future adventures.